Excel can be easily integrated with Cymatic, forming a real-time bi-directional connection. 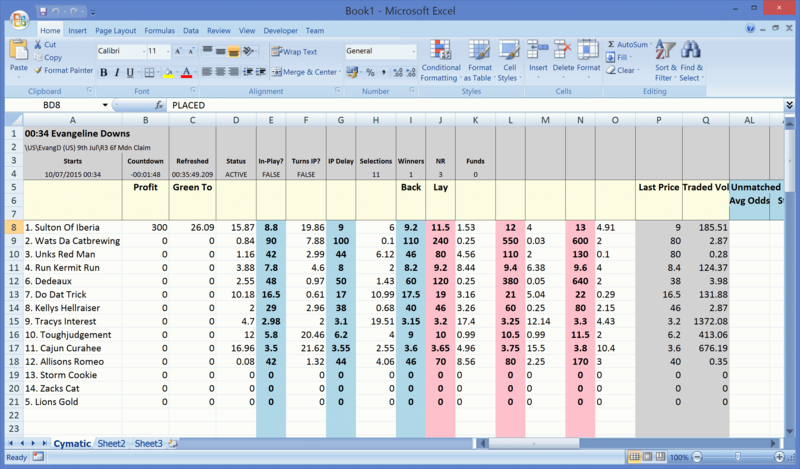 Prices, market information, bet summaries and reports are sent from Cymatic to Excel in real-time, whilst orders can be sent from Excel to Cymatic for automatic submission to Betfair. Fully automated trading. Trade every race, all day long, completely on autopilot and deploy your own custom strategy! Build your own charts and technical analysis indicators. Design your own custom trading screen and market interface. Log price movements and market data. Set alarms for when certain conditions occur. Simply type commands (such as 'BACK') into Excel to instantly trigger orders. Use formulae to do a very wide range of things, including triggering bets based on a multitude of criteria. Write your own code. Ultimate flexibility is possible using Excel's built in code editor, which allows you to write programs in Visual Basic (VBA). 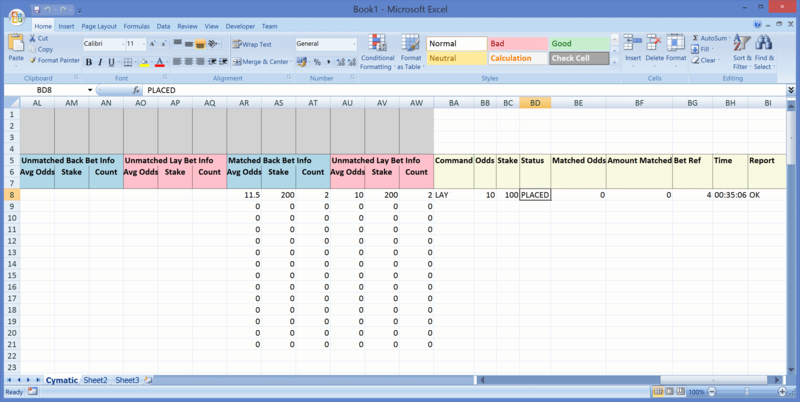 There are various sample spreadsheets provided on the Cymatic forum, containing formulae and sample Visual Basic code. There are also several other really useful spreadsheets which have been created by users and shared on the forum. Please note that you can use the freeze panes feature in Excel if you wish to see the Command columns beside the market data columns. Alternatively you can use a separate sheet to build your own prefered view of the data, by using formulae to link to the data in the Cymatic worksheet.